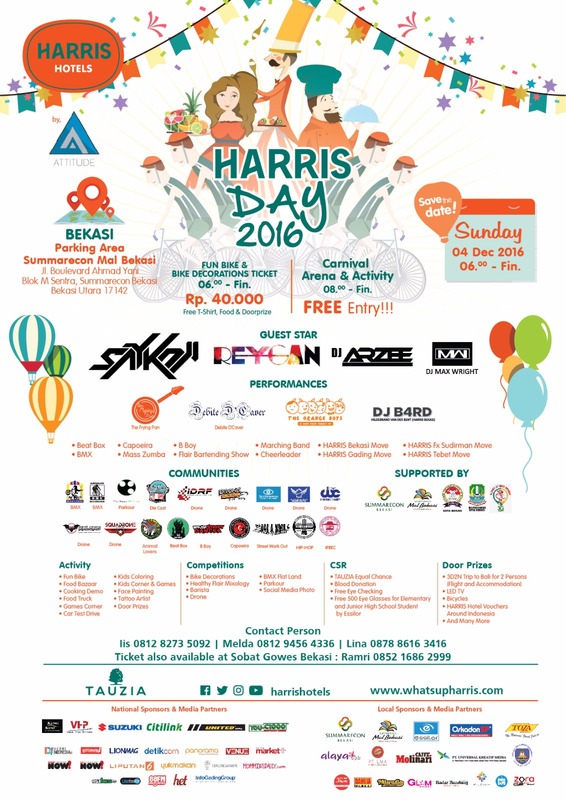 Carnival and fun bike will be held in HARRIS DAY 2016 organized by HARRIS Hotel & Conventions Bekasi, HARRIS Tebet, HARRIS FX, HARRIS Kelapa Gading, HARRIS Sentul, HARRIS Ciumbuleuit and HARRIS Festival Citylink under Tauzia Management on Sunday, 4th December 2016 start from 6am until 5pm. The bikers will cover a distance of ±10km, they will start and finish at Summarecon Mall Bekasi Car Park, next to the HARRIS Hotel & Conventions Bekasi. Approximately 2500 visitors will be participating in the carnival & 1000 bikers will be participating in the fun bike. The participants come from various bike communities in Bekasi, Jakarta, Sentul & Bandung, families, hotel guests, media, HARRIS players, and Tauzia Management. Lots of door prizes will be given such as LED TV, Bicycle, Hotel Vouchers, 3 Days 2 Night trip to Bali for 2 persons (flight and accommodation) and many more. All the participants can enjoy the activities and performances. It will be so much fun to join in the event, activities on the day such as the sunday market that offers food and beverages corner, healthy cooking demo, face painting, tattoo artist, car test drive, games corner, kids coloring, flair bartending show, beat box, capoeira, mass zumba, b-boy, bmx, marching band, cheerleader, the famous HARRIS move, and HARRIS band. Other excited competitions and performances on that day are bike decorations, BMX flat land competition, healthy flair mixology competition, barista competition, drone competition, parkour competition and social media photo competition. To make the event more exciting, HARRIS Hotels provides several entertainment activities such as national artist performances “SAYKOJI”, “REYGAN”, and line up DJs such as DJ MAX WRIGHT and DJ ARZEE. Local media partner that participate in this event are HITS Radio, Dahlia Radio, Zora Radio, Star Glam, Info BDG, Radar Bandung, Warna Nusantara, and Whatsnewjakarta.com. There also several local sponsor to support the event such as Summarecon Bekasi, Summarecon Mall Bekasi, Essilor Indonesia, Oskadon SP, Toza, Caffe Molinari, Alaya Spa, Sekolah Ananda Bekasi and PT Universal Kreatif Media.